FHIR® – Fast Healthcare Interoperability Resources (hl7.org/fhir) – is a next generation standards framework created by HL7. FHIR combines the best features of HL7's v2 , HL7 v3 and CDA product lines while leveraging the latest web standards and applying a tight focus on implementability. FHIR solutions are built from a set of modular components called "Resources". These resources can easily be assembled into working systems that solve real world clinical and administrative problems at a fraction of the price of existing alternatives. FHIR is suitable for use in a wide variety of contexts – mobile phone apps, cloud communications, EHR-based data sharing, server communication in large institutional healthcare providers, and much more. Strong foundation in Web standards: XML, JSON, HTTP, OAuth, etc. A central challenge for healthcare standards is how to handle the wide variability caused by diverse healthcare processes. Over time, more fields and optionality are added to the specification, gradually adding cost and complexity to the resulting implementations. The alternative is relying on custom extensions, but these create many implementation problems too. FHIR solves this challenge by defining a simple framework for extending the existing resources and describing their use with Profiles. All systems can read all resources, but applications can add more control and meaning using profiles. Many healthcare contexts require extensive local agreements. In addition, each resource carries a human-readable text representation using html as a fall-back display option for clinical safety. This is particularly important for complex clinical information where many systems take a simple textual/document based approach. 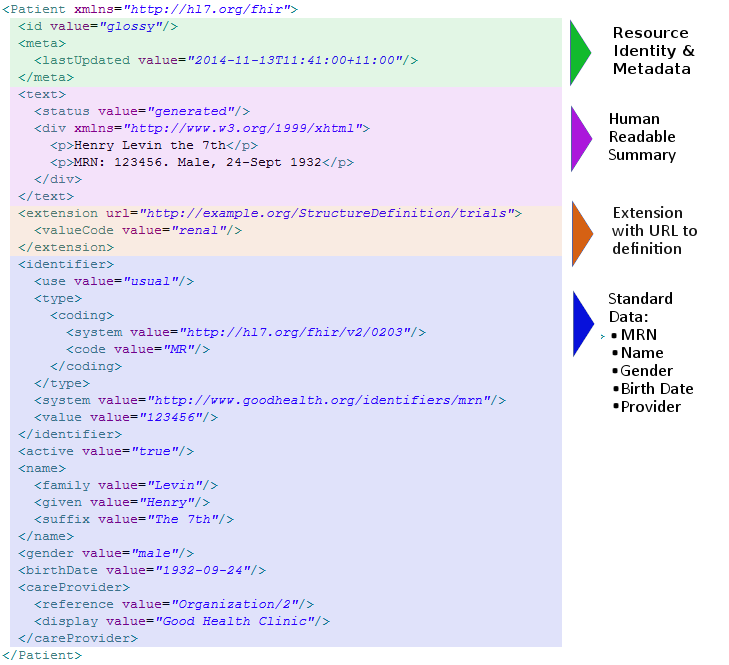 This simple example shows the important parts of a resource: a local extension, the human readable HTML presentation, and the standard defined data content. FHIR has resources for administrative concepts such as patient, provider, organization and device as well as a wide variety of clinical concepts covering problems, medications, diagnostics, care plans, financial concerns and more. FHIR is published as a Standard for Trial Use. During the Trial Use phase, HL7 actively monitors implementations in order to continue to improve the specification to be responsive to their needs. Due to the many advantages FHIR offers, trial use is already beginning right now.